Fishing, Hunting, Camping, Canoeing and Nature Observation. The Turtle-Flambeau Waters - nearly 19,000 acres of it for you to use and enjoy in a variety of ways. The Turtle-Flambeau Flowage is a result of the 1926 construction of a dam to create a reservoir. The dam created 18,900 acres of water with 212 miles of winding shoreline. 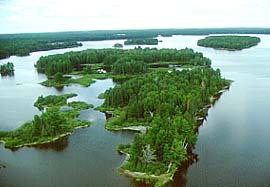 The Turtle-Flambeau Flowage encompasses nine lakes, three rivers and several creeks, all beautifully free of pollution. The Turtle-Flambeau Flowage invites people who enjoy the solitude of a vast wilderness in which to pursue their limit of walleye, smallmouth bass, musky, and panfish. Turtle Flambeau Flowage Guide Service is available, for singles, couples, or groups. Guides will pick you up at the cabin front door and return you when your fishing day is complete. Walleyes: The famous Turtle Flambeau Flowage, (19,000 acres of water) is rated by the Wisconsin D.N.R. as having one of the best walleye populations per acre of water in the state. Laid out with open mud flat areas, miles and miles of river channels, log jams, rock, and sand shorelines, submerged as well as visible stump fields, hundreds of center lake rock and mud humps, back bays, islands, bogs, and numerous weed beds makes for excellent fish habitat. Smallmouth Bass: Although much known for its fantastic walleye fishing the Turtle Flambeau Flowage also boasts a excellent population of Smallmouth Bass. With 19,000 acres of superb smallmouth habitat, abundant feed, and acres of prime spawning areas the smallmouth population on the Turtle Flambeau Flowage has exploded in the last six years. Commonly referred to as “footballs”, the Turtle Flambeau Flowage produces much heavier smallie than the average inch to pound ratio than most other bodies of water. From early spring to late fall the smallmouth can be found roaming the various structures of the TFF. Musky: In order to determine the status of the musky population, survey crews returned after the walleye spawning season to obtain information on the general health of the musky population. A total of 253 musky were captured through this effort. Of the total fish sampled, 14% or 36 fish were larger than 40 inches in length. 30% (76) were greater than 36 inches. The largest musky sampled was 51+ inches in length and over 45 lbs. Based on this survey, the Flowage continues to demonstrate its ability to provide outstanding trophy musky angling opportunities. and are the property of Flambeau Lodging. Copyright © 2017-2018 Flambeau Lodging All Rights Reserved.